He is very well known as Mr. Bean. His full name is Rowan Sebastian Atkinson was born January 6, 1955, he was born in Consett, County Durham in 1955, the family of Eric Atkinson, a farmer and company director, and his wife Ella May (nee Bambridge). His brother is a politician Rodney Atkinson. He attended Durham choristers School, then St Bees School, and studied electrical engineering at Newcastle University. When in school, he was a classmate of former prime minister Tony Blair. He later earned a M.Sc. from Queens College, Oxford. 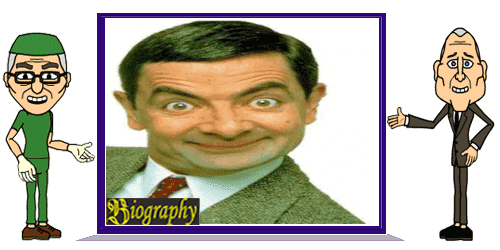 Rowan Atkinson is a comedian, actor, and author of England, best known for the television series Blackadder and Mr. Bean, he began appearing on television in the show Not the Nine O'Clock News, followed by The Black Adder, and then Mr. Bean. Atkinson has starred in ads for Hitachi, Fujifilm, blood donors, and Barclaycard. Four Weddings and a Funeral, The Lion King, Rat Race, Love Actually, and he actor Mr. Bean, In addition, he appeared in the film Never Say Never Again, Four Weddings and a Funeral, The Lion King, Rat Race, Love Actually, and plays a major role in Bean, Mr. Bean's Holiday, and Johnny English. Atkinson married to Sunetra Sastry in 1990, have two children, Lily and Benjamin, and lived in Oxfordshire village. He has a collection of cars and writing for the magazine Car and Evo. Car collection consisted mostly of Aston Martin, including the DB7 used in Johnny English. Aston Martin V8 Zagato his license plates "COM1C", and drove in the film The Tall Guy.